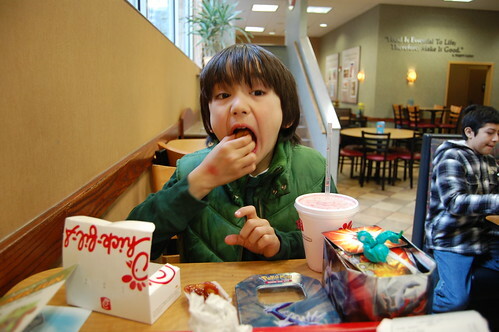 After Vince's weekly ballet class, we usually go to the Chick-fil-A down the block for lunch. We order 2 kiddy meals - one for him (6 piece nuggets) and one for me (2 chicken strips). He gets one of the toys and we save the other for Edda. I don't often spend time with only one child at a time, so I really like that we have this ritual. It also helps that Chick-fil-A is quite yummy - yummier than McDonald's. We will go to Chich-fil-A next time. Okay, let us drive together across the country again to the South, or at least, to the East. I don't think there is Chick-fil-A here in the NW. Btw, Chick-fil-A was ranked very top about its healthy food among all the fast food restaurants.